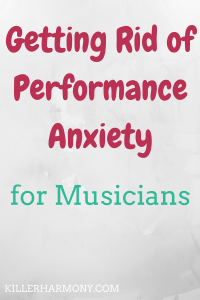 If you are a musician or any other type of performer, odds are you have had some performance anxiety or nerves. This is totally common, and even the greatest performers sometimes get nervous. I have had my fair share of stage fright, anxiety, nerves, whatever you want to call it. But over time, I have managed to overcome those feelings and to turn that nervous energy into positive energy. It takes practice to get rid of performance anxiety, but you can do it. So, here are some of my tips for getting rid of nerves and giving your best performance. 1. Practice ahead of time. This sounds obvious, but it needs to be said. The more prepared you are for a performance, the less you have to worry about it the day of. Leading up to a performance, you want to make sure you give yourself enough preparation time. Give yourself at least a month, or longer depending on the nature of the performance. You need enough time to really learn and study what you will be performing. No “winging it” as they say. Now, I do believe there is a limit to practicing. I have found that if I practice a piece too much or too often, I peak before the performance. You don’t want that. You want to peak during the concert or show. If you will be performing an entire sonata, for example, you want to break it down into more manageable parts. First break it up into the different movements. Next, look for the big sections of the movement. Then, find the phrases and even look at the separate bars. By breaking something down, you can focus on individual parts of the work. There will be easier sections, and there will be harder sections. When you see each section and can isolate them all, you can quickly see which sections need the most attention. I will admit that I don’t always do this, but it is super helpful when I do. I can focus in learning a small phrase or two instead of an entire movement. One or two phrases sounds a lot less intimidating than a whole movement, right? 3. Memorize the difficult bars. If there are a few difficult bars in your music, you should try to memorize them. Even if you are playing with music, it is important to have everything under your fingers. Memorization will help build muscle memory, and you won’t have to worry as much about those sections. There will be at least one or two of “those bars” in almost every piece. Memorizing them will help with your memorization skills, and you will get to know those difficult parts really well. But obviously, don’t just focus on those bars. You want to make sure that you learn the entire piece. While you are working on a new piece to perform, try to practice it on stage a few times. If you can play it through on the stage you will perform on, that’s great. If you can’t, then recreate that environment. Practice while wearing the shoes you will perform in and the outfit you plan to wear. It sounds silly, but doing that will get you ready so that you know you can do it. Normally, you won’t be practicing in fancy clothes or dress shoes. But that’s commonplace attire for performances. If you are only used to wearing sweats and tennis shoes while practicing, then of course the different clothing would make you nervous. Recreating the performance environment to the best of your ability will help prove to yourself that you are ready to give the best performance of your life. It may sound counterintuitive, but taking a break close to the performance is a good thing. A break will give your mind and body time to rest and be ready for the performance. I like to take a break for about thirty minutes to an hour before the performance so that I can breathe and take in everything. I do warm up before that, but I don’t usually run through what I am performing, unless there are still some rough spots. This is because I want to avoid overworking the piece. As I said earlier, you want to peak during the performance, not before. Giving yourself a break before going on stage is a great way to recharge your muscles and give you a boost of energy. There more you perform, the easier it will get. I have been performing since I was really young, and I performed even more often when I got to college. That performance experience helped me and one of my classmates get over stage fright. For my music degree, I had to give two solo recitals, perform on two other recitals each semester, perform for a masterclass each semester, and also perform as part of any ensembles I was in. All that performing made any bouts of nerves just go away. Any nerves I get are quickly turned into adrenaline. I am able to coast through a performance without worrying about everything else. I can just play. 7. Understand that it’s normal. Everyone has gone through periods of stage fright, nerves, performance anxiety. And it’s okay. It is super normal to be nervous. When I do feel nervous, I remind myself that there’s not much to be scared of. Is the audience the big scary thing? Well, they aren’t there to see you fail. They want you to play well, and they want to hear good music. Why else would they have come to a concert? Are you afraid of making mistakes? It happens to everyone. And odds are, no one will notice. As long as you keep your composure, you can make it seem like you meant to play that note or that rhythm. It’s easier said than done, but don’t worry about it. Do you have any other tips for getting rid of performance anxiety? Leave a comment below, and don’t forget to sign up for the Killer Email Squad to receive music tips right in your inbox!